As Chief Scientific Officer, Brandi oversees all aspects of scientific innovation with a focus on creating solutions that accelerate biomedical discovery. Brandi leads the development of collaborative data analysis ecosystems for the National Cancer Institute and National Heart Lung and Blood Institute where she works with stakeholders to shape novel mechanisms and global standards for data access, analytical reproducibility, and usability. 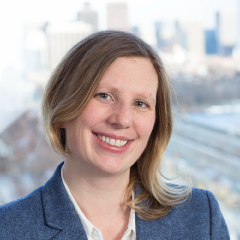 Brandi holds a Ph.D. in Biochemistry from Tufts Sackler School of Medicine where she focused on the impact of small RNAs in cardiovascular disease. As a fellow at Harvard University, Brandi applied next-generation sequencing technologies to understand the molecular underpinnings of ALS. Brandi’s work has been published in leading journals including Nature, Science Translational Medicine, and Molecular Cell.